Looking for fun, skill based activities to keep kids engaged all month long? I have compiled a list of my top 5 favorite Math, Literacy, Science, and STEM activities to do with students this January! 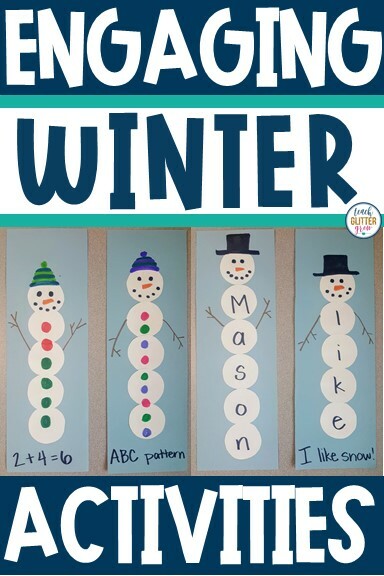 I love doing these activities each winter because they are fun, can practice a variety of skills, and always come out looking cute! No matter what skill you choose to practice, prepping the activity is the same. All you need are large pieces of construction paper cut in half length wise, white paper, glue, and crayons/markers/colored pencils. 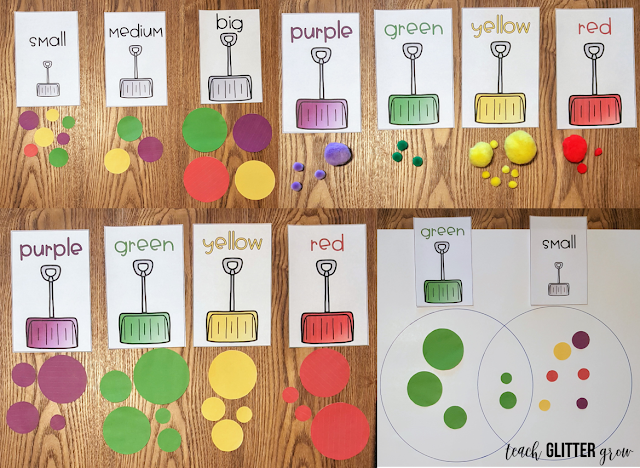 You can either cut the circles for students ahead of time or create a few circle templates or something for them to trace and cut out their own circles. 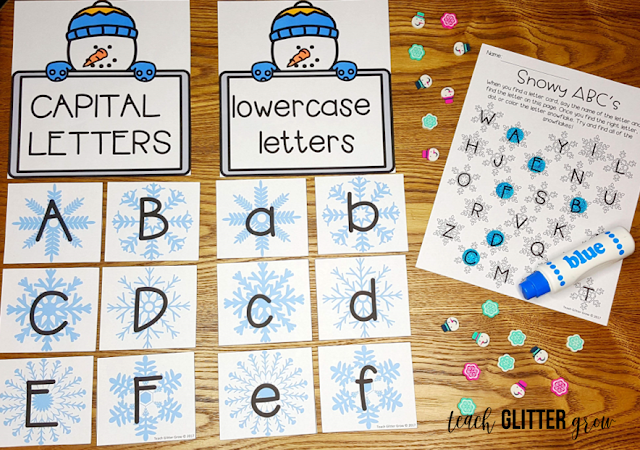 For students still learning how to write their first (or last) name, the name spelling snowman is perfect! Once everyone has created theirs, you can also turn it into a math activity and compare how long each name is and graph your results! 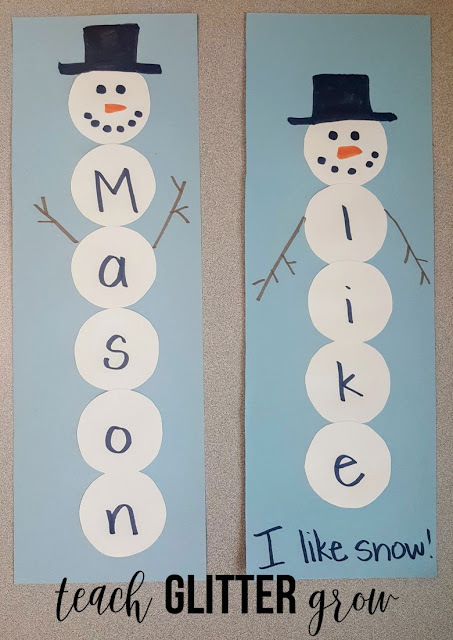 For students who are ready for sight words, I like for them to create these sight word snowmen. You can either give them a word to practice or they can choose a word that they have recently learned. Students can even write a short sentence using their sight word at the bottom of their snowman. 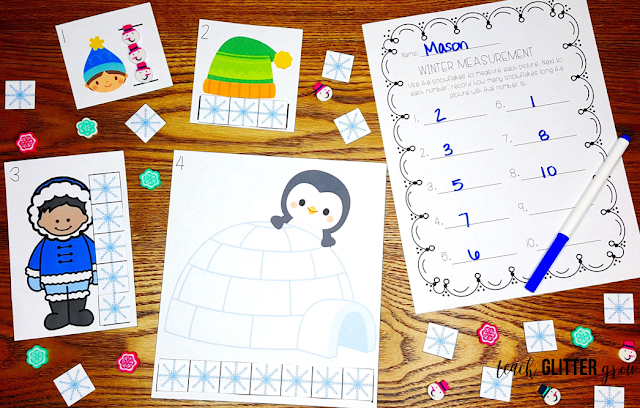 For math, students can create snowmen that help them practice counting, patterns, or addition. 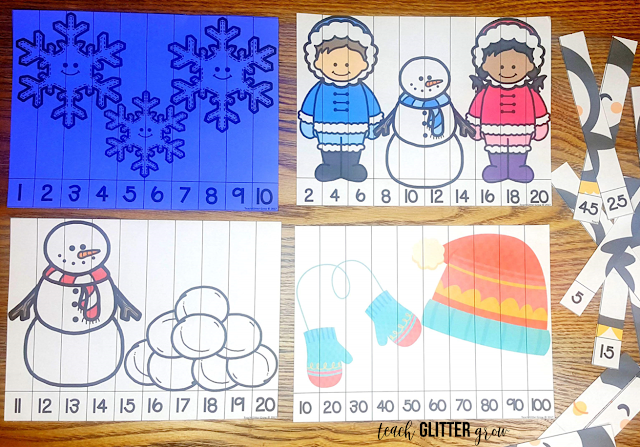 To create a counting snowman (not pictured) students can create their snowman, draw a group of buttons, and then write the numeral that represents the quantity of buttons at the bottom. 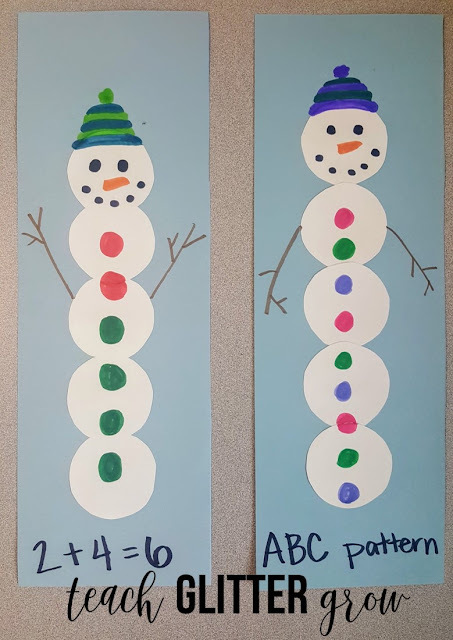 To create a patterned snowman, students can create a button pattern using alternating colored buttons on the snowman. 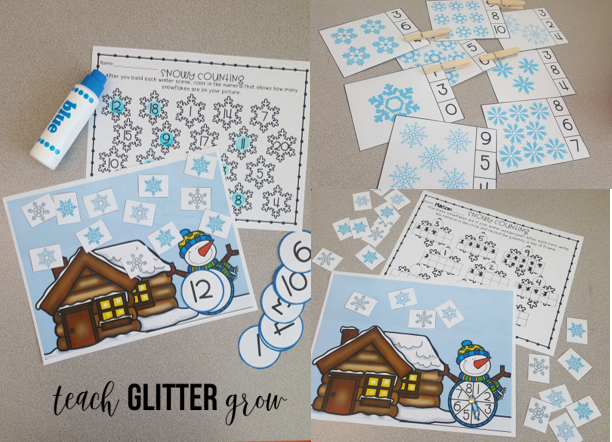 To create an addition snowman, students can choose 2 different colors to draw buttons on their snowman then write an addition equation at the bottom showing how many buttons the snowman has in all. 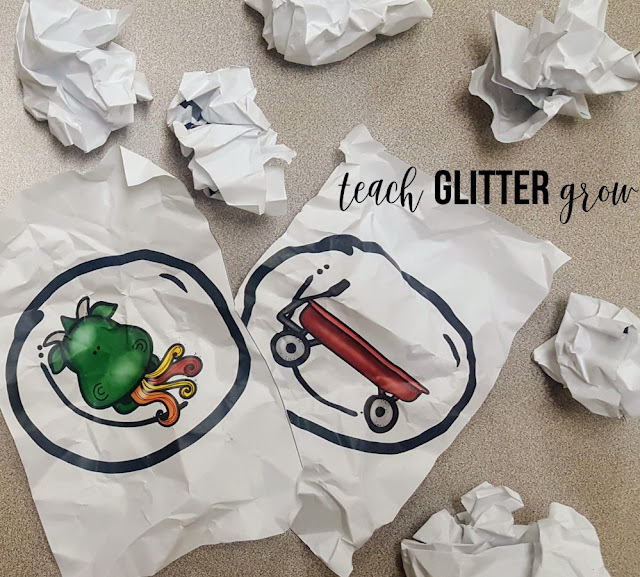 This is a very fun, low prep activity that gets students up and moving and can be used with pretty much ANY skill you are teaching! 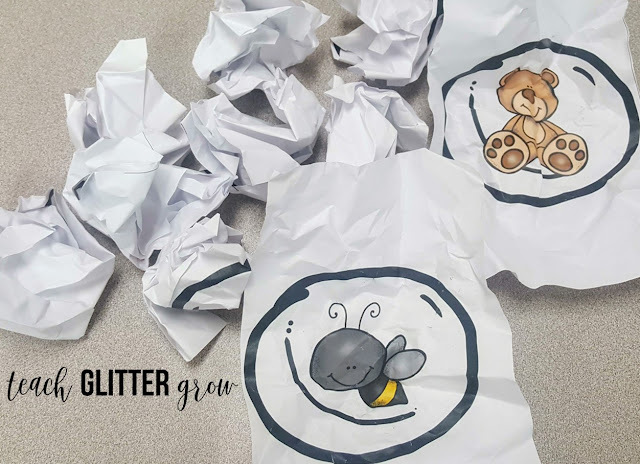 To prepare for the snowball fight, gather lots of pieces of white paper (AT LEAST 1 per student but more is better) and write down whatever skill you want students to practice on each sheet. For example, if you want students to practice letter ID, write a different letter on each piece of paper. Ball up each piece of paper into a "snowball" and toss the snowballs around the room. •Find a partner – Students must find a partner that has the snowball that goes with their snowball. Using the letter ID example, students might find someone who has the same letter as they do matching capital to capital or lowercase to lowercase. •Produce – Students must say what is on their snowball. For letter ID this could be naming the letter. Other students could make the letter sound or even produce a word that begins with that letter. After students have completed the task, they can divide into two groups, throw the snowballs, and continue the learning fun! There are SO many skills that you can use this game to practice and students are sure to love it every time! Rhyming snowball fight helps students practice identifying, matching, and producing rhyming words. 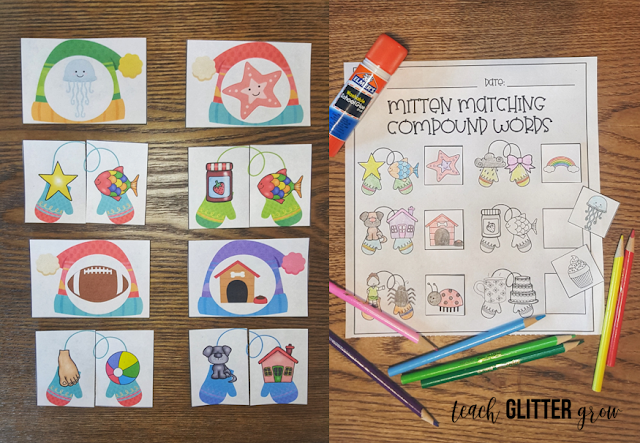 This activity includes 32 colorful snowball cards (16 different rhyming pairs) and is ready to print and crumple! You can find it here or by clicking the picture below. 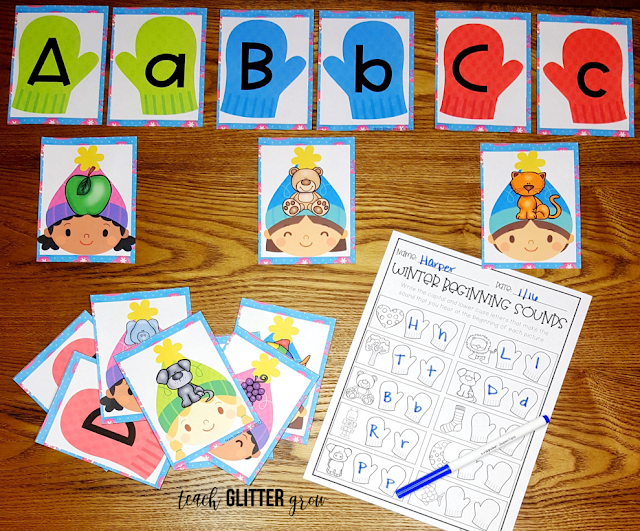 Alliteration/Beginning sound snowball fight helps students practice identifying, matching, and producing beginning sounds as well as words that begin with the same sound. 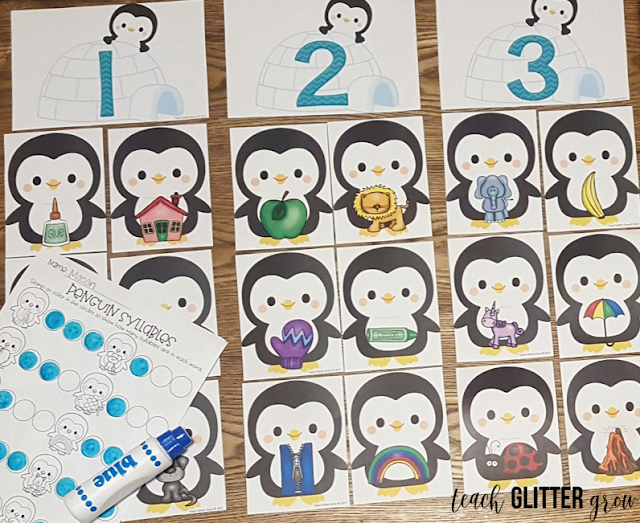 This activity includes 52 snowballs with colorful pictures (2 pictures for each letter of the alphabet) and is ready to print and crumple! 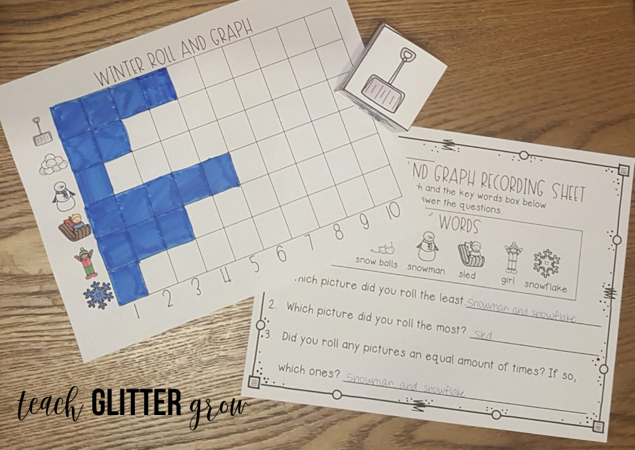 When I saw this awesome activity by Frugal Fun for Boys and Girls, I knew it would be PERECT in my classroom! To prep this activity, all you need are popsicle/craft sticks, paint (optional), and magnets (optional). I say optional for paint because while her popsicle sticks look beautiful painted, I know as teachers we don't always have time for that! 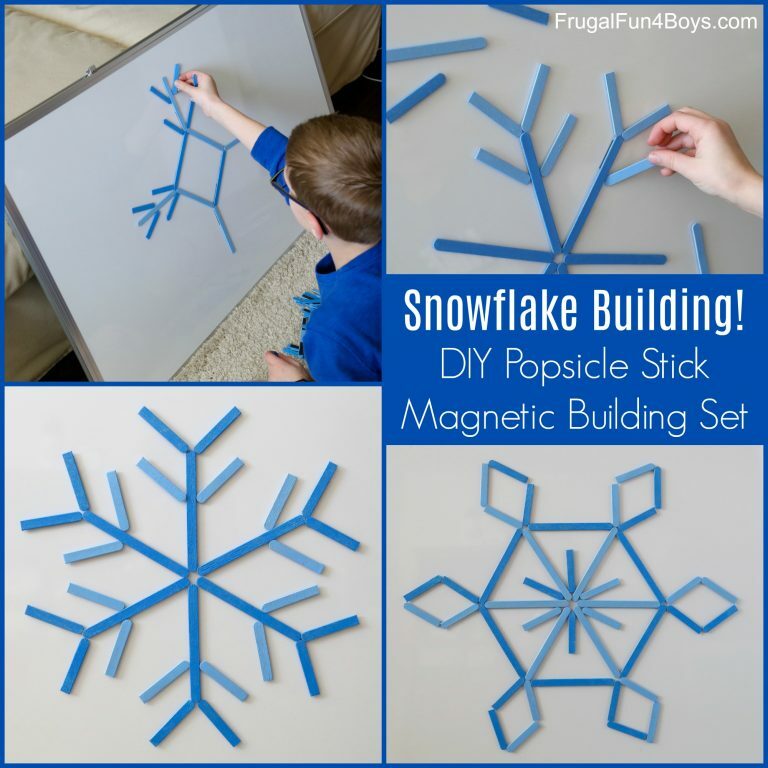 I also think that the magnets are optional because while it is always neat to work on a vertical or magnetic surface, this activity would work just as well on top of a table or spread out on the floor! To create the different sizes, leave some of your sticks whole while cutting others in half. I think this is a great way for students to get their creative juices flowing as a STEM activity or a perfect activity to go along with a lesson on symmetry or even shapes! 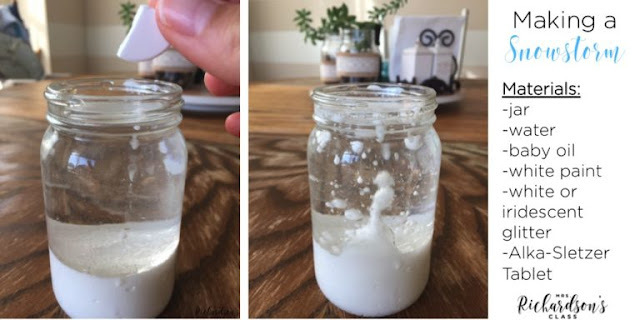 If you are looking for a simple science experiment that your students will LOVE, you should definitely check out this Snow storm in a jar freebie from Mrs. Richardson's Class. With just a few simple ingredients (most of which you probably already have) you can do an engaging density experiment that is perfect for this time of year! 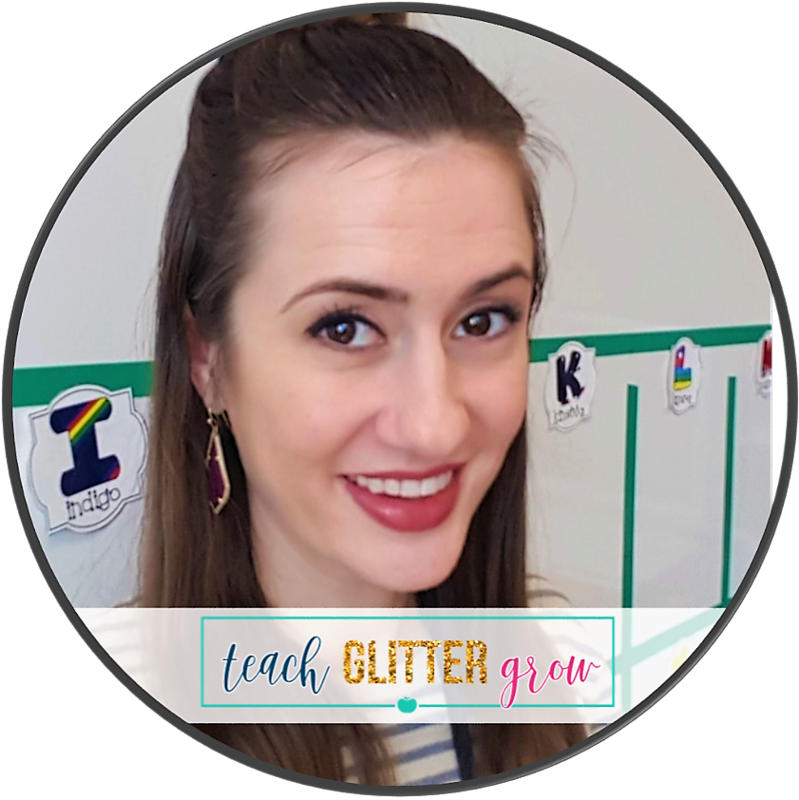 She has even included a teacher page with materials, questions to ask, and student journal pages! 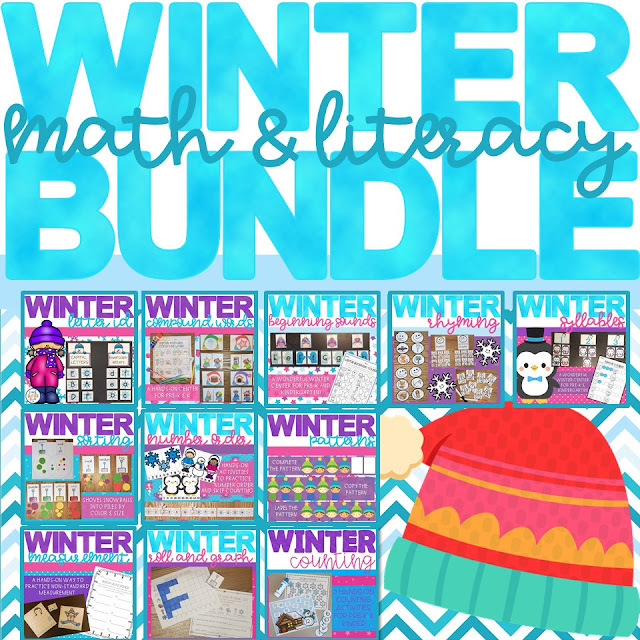 This collection of 11 fun, hands-on Math and Literacy activities is perfect to use whole group, small group, or in centers all winter long! 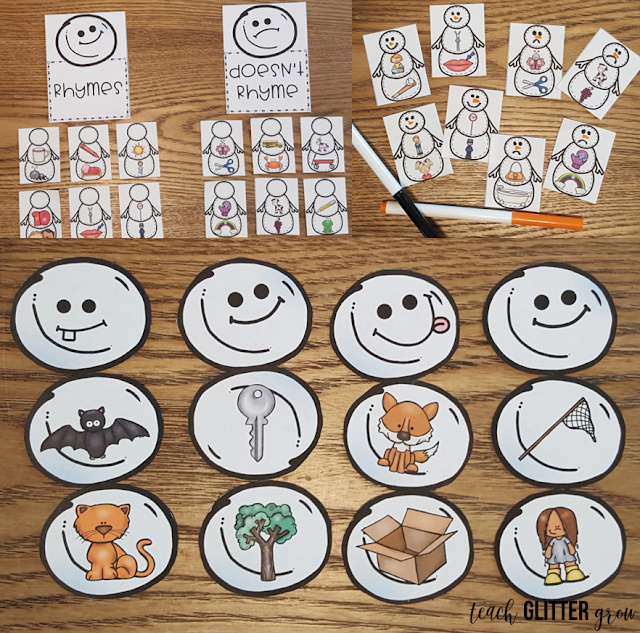 You can click on any of the pictures to go to that resource or to save BIG and get all of the activities, you can view the bundle here.